The Nature Conservancy is collaborating with the Florida DEP-Charlotte Harbor Aquatic Preserves and the City of Punta Gorda to create oyster reef habitat adjacent to Trabue Harbourwalk. This pilot project will use three different restoration methods: oyster mats, bags filled with shell material, and loose shell surrounded by a perimeter of oyster bags. These materials provide a base for oyster larvae to settle and grow. 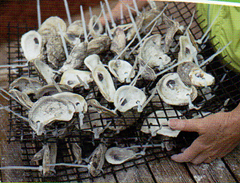 Oyster reefs are the foundation of healthy bays and estuaries. Reefs provide food and habitat for birds and marine life such as crab, shrimp and fish. They buffer our coasts from waves, filter water to improve quality and clarity, and support the growth of coastal vegetation like mangroves and seagrass beds. Volunteers are needed to help with all aspects of this project. From preparing mat material, to making oyster mats and filling bags with shell, to deploying the materials in the water.